In 1967, Detroit was shaken by the 12th Street Riots which lasted from July 23 to July 27. In just 4 days time 23 civilians were killed and 16 police and military members were also killed. The number of wounded on both sides go way into the hundreds. It was a very dark time in America’s past that was caused by racism, classism, and poverty and the tensions among the three being pushed to their very limits. In the middle of all this, an incident occurred at the Algiers Motel in which 3 people were killed under unknown circumstances. 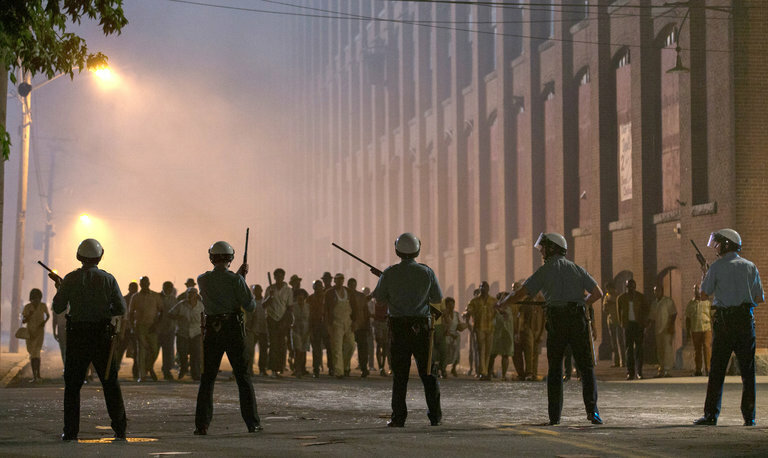 This is the focus of Kathryn Bigelow’s new film, Detroit, a shocking look at what has remained unseen for 50 years. While it’s true no one really knows what happened, it’s clear that Bigelow did a lot of research and investigating of her own, and Detroit will remain as one of the high points of film for 2017. 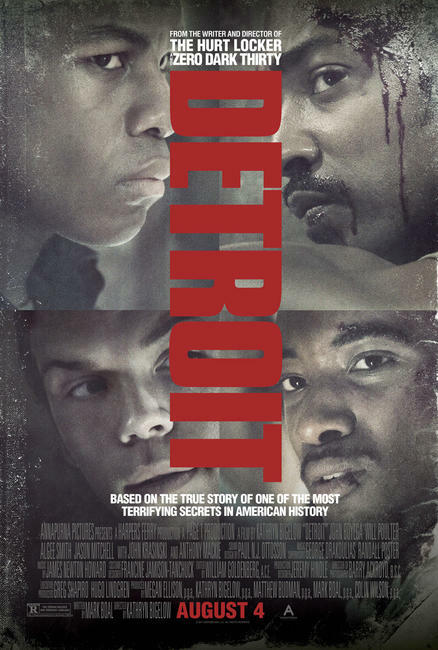 Amidst the 12th Street Riots in Detroit, multiple lives are affected while some are changed forever. Melvin Dismukes (John Boyega) is a private security guard and factory worker who is called to defend a small convenience store overnight, which is situated right beside a National Guard outpost. Larry Reed (Algee Smith), the lead singer of The Dramatics, and his friend Fred (Jacob Latimore) become separated from the rest of the group and end up at the Algiers Motel. It’s here that they meet Julie Ann (Hannah Murray) and Karen (Kaitlyn Dever) and try to hit it off. A prank involving a starter pistol attracts the attention of the National Guard where Melvin is and they all head over to the Algiers. It also attracts the attention Officer Philip Krauss (Will Poulter), a racist cop who believes he has complete authority over the streets of Detroit. At this convergence at the Algiers Motel, violence and hatred erupts which ends in the death of 3 people and a subsequent investigation that held the eyes of all in Detroit. Detroit is a very intense movie that depict real life events, so it’s important that Kathryn Bigelow and the rest of her crew depict things in a very specific way. Luckily, Bigelow has shown herself to be just the person to portray very dramatic real world events with her other films The Hurt Locker and Zero Dark Thirty. With Detroit, a sense of environment is very strong and it succeeds at putting the viewer right in the middle of things, regardless of how chaotic and disturbing something may be. There are times where this film is a marvel to look at and listen to. It feels so genuine and authentic at times that I actually felt like I was transported back to a certain time and place. Part of this has to do with the excellent cinematography. Handheld camera work is something that can be completely overdone nowadays, and it’s often used in movies where it’s unnecessary and is just something to be seen as “artsy.” It’s used perfectly in this film and it never feels out of place. There’s also a very heavy usage of close ups where character’s faces are held in full frame for a good amount of time. It’s a risky move for Bigelow and it requires her to also have found just the right actors for the parts. The performances in this movie are so good it’s almost scary. In fact, in a couple cases it is scary. John Boyega isn’t in the movie as much as I thought he was going to be but he gives such a natural performance that feels completely unlike his role in Star Wars, which is a good thing since it’s practically impossible to compare these two movies in any way shape or form. Will Poulter, who plays Krauss, is a force to be reckoned with in this movie and it’s by far one of the best and most complex performances of the year. His character is a complete psycho, and the frightening thing is that he doesn’t see that he’s doing anything wrong. Poulter gives a performance that is as horrific as it gets. Finally, the breakout star of this movie is Algee Smith, who I’d say is more of the focal point of the ensemble cast. His IMDb only has in credited in some random things and a part in Earth to Echo, which I think MAYBE three people saw. He is outstanding in this movie and has a bright career ahead of him. Seriously, Hollywood, keep your eyes out for this guy. Detroit also had pacing that I wasn’t expecting, but it’s really the best way the movie could have been done. When I saw that the run time was about two and a half hours, I was a little concerned that it would be overstuffed with useless plot elements that could have easily been removed to turn it into a two hour movie. I really had nothing to worry about, however. The first part of the movie sets the stage for the riots and the characters for a while. Once we get to the Algiers, however, we remain there for a very long time. The whole incident is shot in real time and during this whole event we hardly leave the premises of the motel. This goes on for a really long time, but it never feels boring or overlong. Finally, the third part is the aftermath which keeps the stress from the time at the Algiers raised high. I hate using this word, but the storytelling really was riveting and I couldn’t peel my eye away from the screen for more than a second. This has been a pretty wild summer for movies. There has been so much great stuff that it’s hard to keep track of it all. Amidst all of the cinematic joy, Detroit stands tall as one of the best 2017 has to offer, and yes I realize how often I’ve been saying that. This is a powerful movie about a really dark and tense time in American history and Kathryn Bigelow has the hard task of dramatizing it. The performances and film making are all top notch in this movie and it has to be remembered come Oscar season. It’s been gratifying as a fan of the horror genre to see some really cool, highly original horror films to come out in the past few years. There’s been something of a horror renaissance. That being said, I’m not completely opposed to a film maker taking a familiar approach or using familiar plot devices to create a unique and entertaining horror film. It just has to be done right. Enter film maker Fede Alvarez and his newest film Don’t Breathe. This film is a mix of ideas that has been seen in films like Panic Room, The Strangers, and Wait Until Dark, but it’s important to note that this isn’t a carbon copy of any of these movies. Instead, Don’t Breathe is an unbearably tense, slow burning horror film that’s smartly written and very well executed. Rocky (Jane Levy), Alex (Dylan Minnette), and Money (Daniel Zovatto) are three Detroit friends who make a living off of breaking into and robbing houses protected by Alex’s father’s security company. After a while, the profits from these jobs are becoming less and less from what they have been, which begins making Rocky’s plan, along with all the other’s plans, of leaving Detroit almost impossible. One day, Money is told about a house in the middle of an abandoned neighborhood with $300,000 just waiting to be taken. The seemingly only defense is an older, blind man (Stephen Lang) who seems like he couldn’t do any harm to anybody. When the three thieves enter the house and come closer to finding the money, the blind man wakes up and realizes what’s going on. It becomes clear that he isn’t nearly as defenseless as he looks, which forces the three robbers to quietly maneuver around him in the house, but they soon discover the blind man’s darkest secret that he will kill for in order to protect. For me, Don’t Breathe is one of those movies that really hits what a horror movie is supposed to be on the head. Fede Alvarez previously directed the remake of Evil Dead, which I have not seen, but after seeing this movie and seeing how well he understands the genre, I wouldn’t be opposed to it. This is an incredibly tense film that made me cringe countless times. There were even times where I was afraid to breathe and give away the characters’ location in the house. It a movie can make me tense up and not want to breathe, then I know that I’ve just experienced an excellent horror film. The first time the movie really got me was a quick scene where the blind man quickly walks down a hallway, forcing Alex to quickly hug the wall and remain absolutely silent. The actual scene lasts only a split second, but that’s what makes it so good. There’s no cue that this is supposed to make you jump or feel frightened. The immediacy with which it happens is enough to make anyone feel uncomfortable. And that’s just the beginning. There are so many memorable scenes that almost force you to watch the movie through your fingers. What makes the movie even more effective are the characters and the situation that they are in. I’m not so much talking about being trapped in the house, but more so the living conditions and fighting for survival in the dying city of Detroit. Similar themes were explored in It Follows, and Alvarez continues this exploration with Don’t Breathe. The film’s focus on the environment is really important to telling the story, and the actors play their parts in this world very well. They have more dimensions than what can be expected in most horror movies, even though their performances aren’t exactly out of this world. Stephen Lang on the other hand is outstanding. The outside world doesn’t so much affect him, which is why he is so threatened when outsiders enter his domain. He is a formidable presence, and while he doesn’t say too much in the film, it’s all about his actions. Like Michael Myers and Jason Voorhees before him, the blind man is a nearly unstoppable force that gives you the creeps whenever he’s onscreen. Lang really was the only choice for this character and he’s excellent. It’s also worth mentioning that Don’t Breathe is just an artistically and technically well designed film. The cinematography is perfect, and some scenes had me really loving the look of the film. The lighting is very important to the tension of this movie and without it done just right, the movie probably wouldn’t have been as effective as it was. A lot of attention was also given to the sound, and rightfully so. A large part of this movie is focusing and becoming paranoid about any little sound that may give away the location to the blind man. Every little click and whisper is magnified, which adds a sense of distress that I felt as a viewer. One great scene had such a quiet explosion when one character steps on a squeaky floorboard. The sound and the visuals all go above and beyond. Don’t Breathe is not only a great horror movie, it’s just a great movie in general. The performances, especially by Stephen Lang, all work very well and it’s just a very well put together movie. The idea of someone breaking into my house and invading my space is one of the most terrifying ideas to me, and seeing that idea completely flipped on its head was interesting and made for a unique time at the movies. I really want this movie to be remembered years from now, as it’s a prime example of how to properly craft a suspenseful horror film. Crime movies are some of my favorite kinds of stories. Wether it’s told from the side of the criminals, the police, or both, these movies tend to excite me and grip me until the very end so long as the story is good enough. For this review, I’m going to be looking at Street Kings and its sequel Street Kings 2: Motor City. I can’t really say my feelings at this point on the sequel, but I was very excited to see the original Street Kings. I heard a lot of great stuff about it, and now that I’ve finally seen it, I’m honestly a little underwhelmed. As always, we’ll be starting with the original 2008 film by David Ayer. Tom Ludlow (Keanu Reeves) is a star in the LAPD, but his unorthodox techniques and his heavy drinking is starting to get the better of him even with the support of his police unit, run by the affable Jack Wander (Forest Whitaker). What only adds more to Ludlow’s stress and drinking is the fact that his old partner (Terry Crews) is informing on him to an internal affairs captain, James Biggs (Hugh Laurie). When Ludlow is at the scene of his ex-partner’s murder, Biggs really sets his sights hard on Ludlow who is now determined more than ever to find the real killers. With the help of homicide detective Paul Diskant (Chris Evans), Ludlow starts a small war with the criminal element of L.A. in hopes to force the murderers into the open, but the corruption plaguing the police force goes deeper than Ludlow ever anticipated. It’s clear that Street Kings has all of the makings of a really cool cop thriller. There’s a strong cast, David Ayer in the director’s chair, and the original story was written by James Ellroy, who is known for penning the modern classic L.A. Confidential. Well, Street Kings doesn’t quite live up the hype that I’ve been exposed to. So many people have told me that this is a must see movie, and honestly, it’s just alright. It certainly isn’t a bad movie, but you have to admit, it’s pretty derivative. Reeves’ character is a cop who most certainly doesn’t play by the rules, and then has to clear his name and weed out the corruption in the police force. It’s so many different clichés rolled up to form an even bigger cliché in the form of a two hour movie. Everything that happens in the movie has been seen before time and time again. I don’t want to make it sound like Street Kings is a total waste of time, because that’s not the case. In fact, it’s a pretty competent movie for the most part. The cast really does their best with the material that’s given to them with Whitaker and Evans really stealing the show. David Ayer also has a really gritty eye, which is why he’s really good with this genre. The streets of L.A. really takes a life of their own and the presence of violence and death always feels like it’s lingering amongst the fog or right around the corner on a dark urban night. There’s plenty of style and Ayers captures it perfectly. I’m really only disappointed in the writing. I don’t know what Ellroy’s original screenplay was like before other writers hopped on to add their own take on things, but if it’s as clichéd as the final product, I’m pretty disappointed. 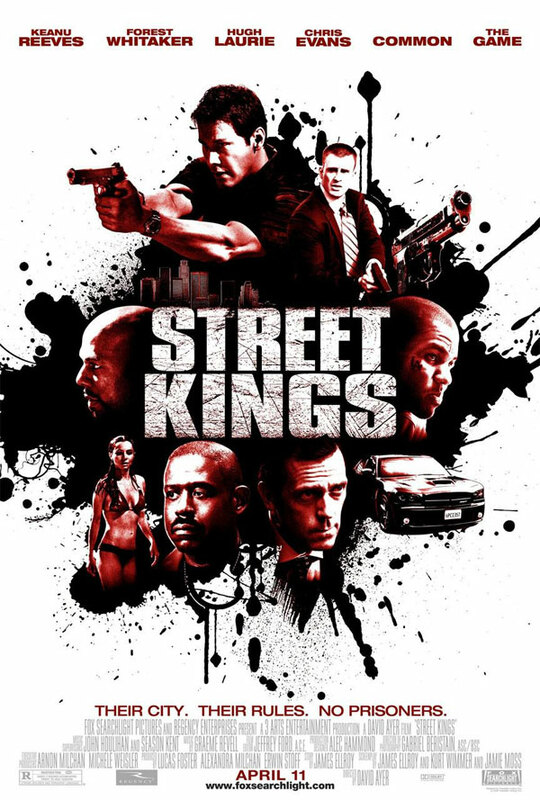 If you’re looking for an easy way to kill a couple hours, then Street Kings is a fine choice. You really don’t have to think to hard because the story and characters are all so familiar. As a movie to watch and review, I have to say it’s a bit of a disappointment. I’m not upset that I watched it, but I really have no need or desire to watch it again. Street Kings is one of those movies that needs no sequel, but it ended up getting one that a lot of people probably never noticed. They took the themes and changed the city, the characters, and the story and released it straight to DVD. This is 2001 film, Street Kings 2: Motor City. Now taking place in Detroit instead of L.A., the story revolves around an aging narcotics detective Marty Kingston (Ray Liotta), who doesn’t have the cleanest record on the force but is known for a couple huge busts. After his partner (Scott Norman) is gunned down after leaving a night club, Kingston teams up with a young homicide detective, Dan Sullivan (Shawn Hatosy). At first Sullivan is wary of his new partner, but after more officers are killed in the same way, the two put aside their differences and begin acting together to find the culprit. Once again, however, the corruption in the police department runs deep and both men find their lives uprooted as the investigation comes closer to a conclusion. This being a direct to DVD release, you have to take everything I say about Street Kings 2 with a grain of salt. Some of these straight to video releases can be good, but there’s normally a reason, wether it’s budget or otherwise, it didn’t get a theatrical run. For what it is, this movie isn’t too awful, but it is pretty bad. One thing good that came from it is that the story, at it’s core, is pretty much the same exact one as the original, which is automatic points off. It does, however, make some changes that I really liked and added a new sense of suspense and tension that wasn’t in the original. It’s also always cool to see Ray Liotta, and he did good in this film, but it’s a sad reminder that his career didn’t exactly go in the right direction. Everything else about this movie is a bit of a joke. While some elements of the story might have been good, the writing in general is far from acceptable. There are some horrendous lines of dialogue that are shamelessly over expository. There are some lines delivered that are downright laughable. Ray Liotta is really the only actor in this movie who isn’t cringeworthy. Shawn Hatosy and Clifton Powell are probably the worst offenders in the acting department for this particular film. I already said that the story is pretty much exactly the same as the first movie which makes this one a copy cat of a movie that was already copying other movies. That made this an occasional chore to sit through. 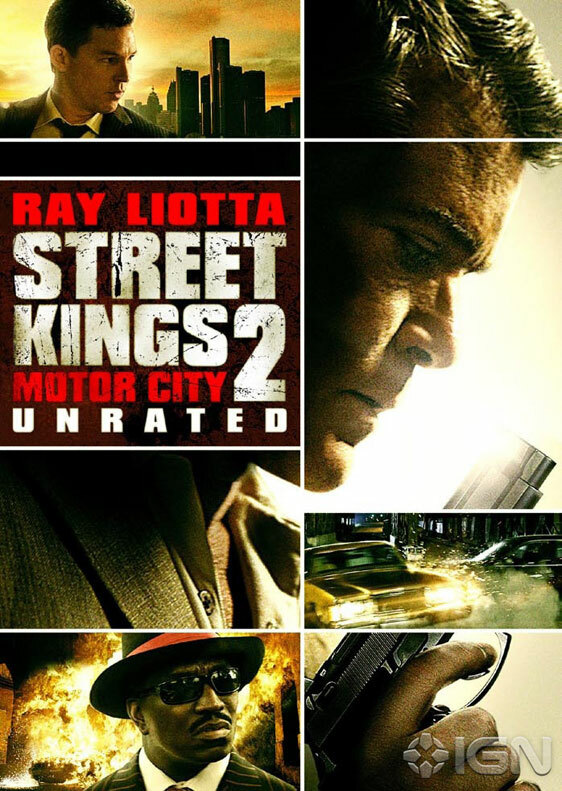 Street Kings 2: Motor City is a coherent movie, but that’s really all I can say about it. The acting is awful, the story is clichéd, and there’s nothing of real substance to be found. A few scenes worked well, but most of them fell flat on their faces. Stick with the first one and leave this sequel well enough alone. It seems that not too much can be said for Street Kings or it’s sequel. The first on is a mediocre cop movie that may be worth seeing once, and the sequel is just a goofy attempt at a drama. Only people who are really into this genre should check out the original. Other than that, there’s nothing else to really discuss.